﻿ Maurice Bishop was leader of the New Jewel Party on Grenada. Maurice Bishop was leader of the New Jewel Party on Grenada. 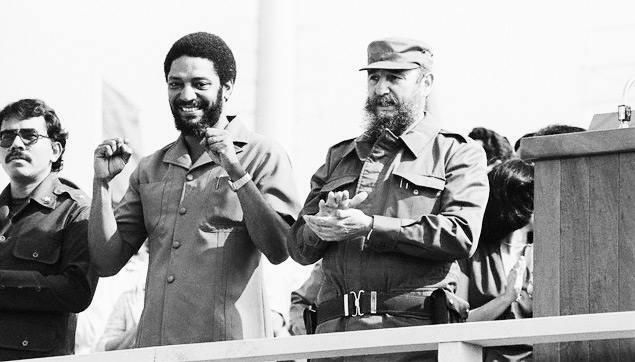 With the New Jewel Party Maurice Bishop ousted dictator Edward Gairy. Born in 1944 and executed in1983. 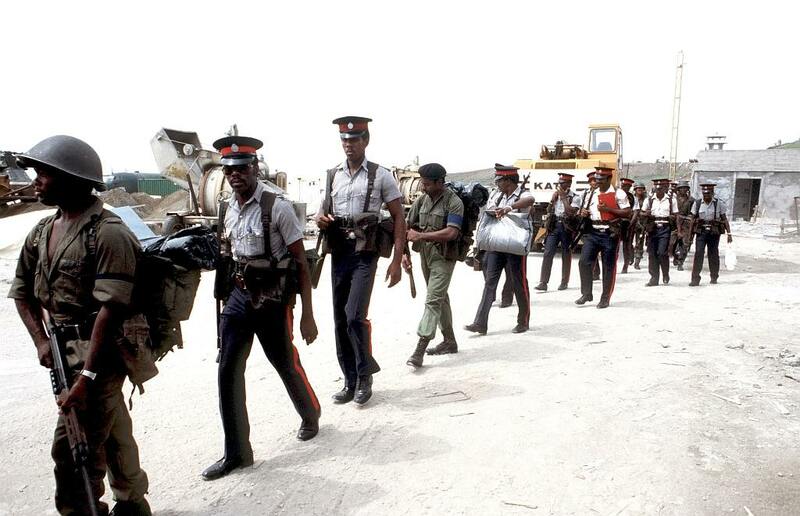 The Grenada seventeen were later sentenced to jail. Guides » History of Grenada – from Prehistory to the Grenada revolution and beyond. 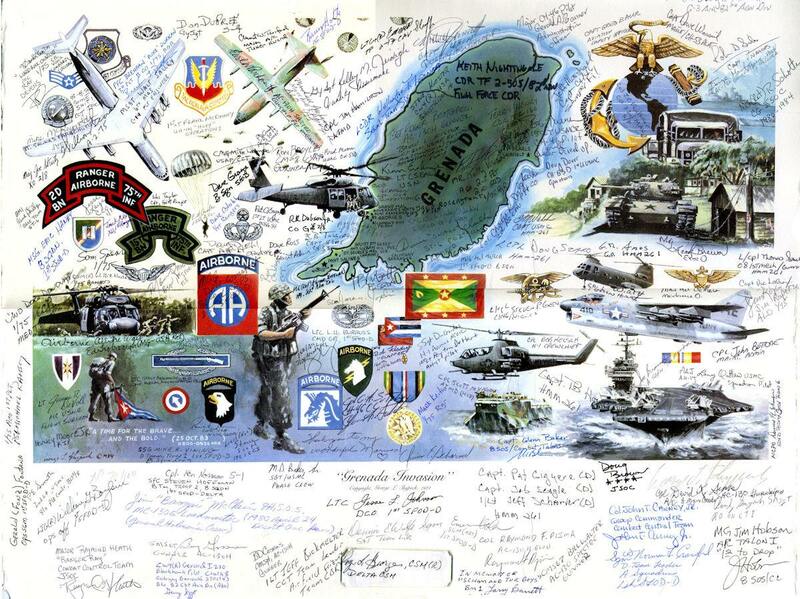 » The Grenada Revolution. » Maurice Bishop 1944-1983. Grenadian leader and Marxist revolutionary. Born in 1944 to Rupert and Alimenta Bishop, Maurice grew up in the British-controlled Caribbean island of Grenada. Like many people in the country, Bishop led a poverty-stricken childhood due to a lack of industrialization and Britain’s lack of concern for the Grenadians’ well-being. 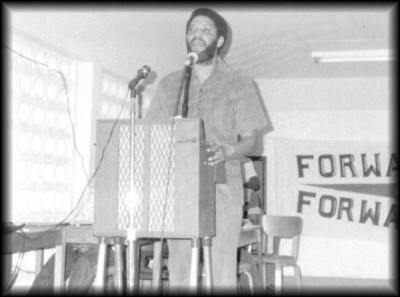 Maurice Bishop speech at Hunters College Grenada. 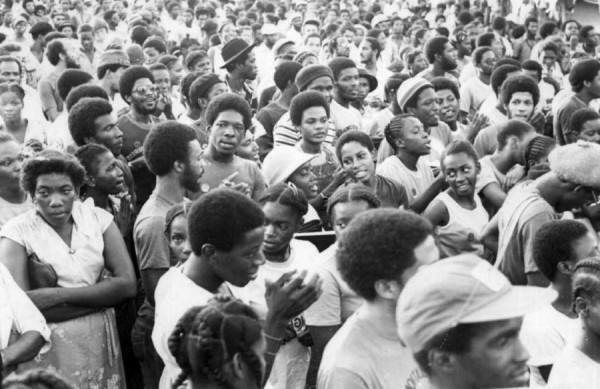 After being a colony for 300 years, in 1974, Grenada declared independence. However, little changed for the island’s people, for the local government (led by Sir Eric Gairy) was still very pro-British. Gairy was apathetic to the plight of the public in Grenada, and he stamped out dissidence with his strong-arm politics. Bishop had formed the New Jewel Movement (NJM) in 1973, mainly from the merging of the Movement for Assemblies of the People (MAP) and the Joint Endeavor for Welfare, Education and Liberation (JEWEL). 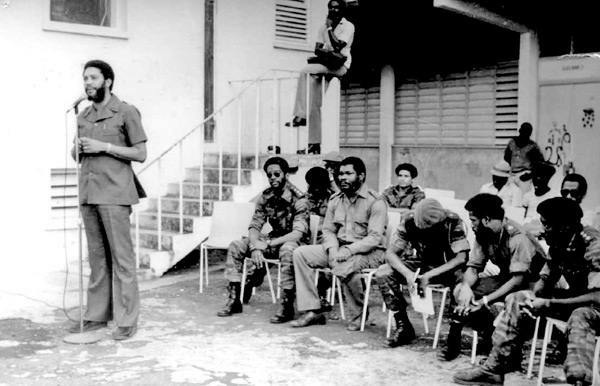 Maurice Bishop at Grenada Revolution assembly. After the independence of Grenada, Bishop’s NJM became the chief opponent party to Sir Gairy. Though the island’s population numbered below 100,000, Bishop and the NJM was able to rally tens of thousands against the dictatorship of Gairy. In retaliation, Gairy unleashed his fascistic henchmen, who called themselves the “Mongoose Gang.” They were responsible for the deaths of many strikers in Grenada, including Maurice’s father Rupert. In 1979, Bishop and his comrades learned of a plan put forward by Gairy to assassinate the NJM’s leaders while the dictator was out of the country. In March of that year, they were able to thwart it with a bloodless seige which took over the nation’s single radio station. With the mass support of the people, Bishop came to power and Gairy found himself without a regime to return to. Bishop installed a revolutionary government that went to work organizing workers’ councils and creating a very participatory government. He worked to develop the island, and received aid mainly from Cuba and the Soviet Union, and later — the Sandinistas of Nicaragua. One of the chief efforts of Maurice was the construction of a airplane runway in order to further tourism for the nation. Bishop was closely influenced by the ideas of Cuban leader Fidel Castro and Nicaragua’s Daniel Ortega. Being the only English-speaking of this Caribbean triad, Bishop hoped to appeal to the working-class of United States — especially the oppressed African American population. But Bishop’s openly Marxist government ran immediately into criticism from U.S. President Jimmy Carter. And later, things only became worse as far-right Republican Ronald Reagan was elected president. Reagan, who secretly supported the right-wing Contras in Nicaragua, also tried stirring up what little oppositon to Bishop there was. Though even the United Nations and the Oranization of American States condemned Reagen’s policies, he continued undaunted. Due to Bishop’s non-abbrassive attitude toward Reagan and his willingness to allow small private businesses to continue in Grenada, Bishop became the target of Bernard Coard, an extreme Stalinist and Minister of Finance. On October 19, 1983, Bishop and most other leaders of the government were rounded up by Coard and his military clique and executed. Bishop and his wife were shot dead in a small and isolated hut in the forest. Coard’s thirst for power had succeeded, but his success was short-lived. Reagan, seeing an opportunity to strike, sent in hundreds of American elite forces into Grenada on October 25. Many were killed. The US then re-installed former dictator Sir Gairy as leader of the nation. Reagen’s aministration accused Bishop and Coard both of building the air strip in order to allow Cuba and the USSR to take over the island. As for Coard, he is occupying a jail cell in Grenada for a life sentence. While Bishop’s government and life were cut short tragically by extremists from both ends of the political spectrum, he remains a light of hope for socialists who see his participatory and egalitarian regime as a perfect example of how a workers nation can be arranged. The United States Department of Justice has informed Prime Minister and Minister of National Security Dr. Keith Mitchell of the results from the examination of the suspected gravesite of former prime minister Maurice Bishop. Technical Assistance for the Royal Grenada Police Force had been requested, following reports of the discovery of human remains in the St. George’s Wilburforce Cemetery. An eight-member team of experts from the Federal Bureau of Investigation, as well as a forensic dentist from Scotland and a pathologist from St. Lucia, participated in the recovery and examination of the remains, which took place in April 2000. Examination of the skeletal remains was conducted at the St. George’s University. The results found that none of the remains are consistent with being the remains of the late Maurice Bishop or one of his political associates who were executed on October 19, 1983. The biological attributes reported for the late Bishop and his political associates are not consistent with that of the remains examined. Based on the scientific evidence, the primary inconsistency noted for the remains is that of biological age, as the individuals represented in the graves are significantly older than former prime minister Bishop and his political associates. Bio: Ogilvie’s role in the history of creating the Grenada Revolution is well established. He was one of the historic forty-six (46) Grenadian patriots and revolutionaries who stormed Gairy’s True Blue Barracks, the barracks housing the dreaded “Green Beasts” as Gairy’s army was called. In the process, Gairy’s entire was defeated without loss of life on both sides. With the birth of the Grenada Revolution on March 13th 1979, Rudi became a member of the People’s Revolution Army (PRA) and led the resistance against the US invasion. Later as a cultural enthusiast, Rudi selfless dedicated over twenty (20) years of service to the calypso art form. Next: L’esterre and paradise beach on Carriacou.